Spun out of Exterran Corporation in mid-2018 with a mission to hire 200 people within six months, Titan Production Equipment has made good on its promise. Titan has seen business surge since July 2018, when it became a standalone company solely focused on oil and gas production equipment. Titan designs, engineers and manufactures equipment used to separate, process and treat hydrocarbon streams. At its production plant near Columbus, Texas, staffing has more than tripled. Titan’s sizeable 210,000 square-foot production facility is one of the largest of its kind in the United States, with a capacity to manufacture more than 4,000 units a year. The plant’s design features a unique fit-for-purpose layout built for high-volume, complex manufacturing, explains Chris Werner, CEO for Titan. The company also moved into new headquarters at The Woodlands, north of Houston. Titan’s deep, in-house engineering capabilities coupled with a capacity to manufacture at high volumes, says Werner, puts the company in a unique position. Titan acquired Exterran Corporation’s North American production equipment business last July. With that, came Exterran’s extensive portfolio of production equipment engineering designs and drawings – what many consider to be an industry standard. That’s an asset to customers who need quality production equipment built to their specs and delivered on time, says Werner. 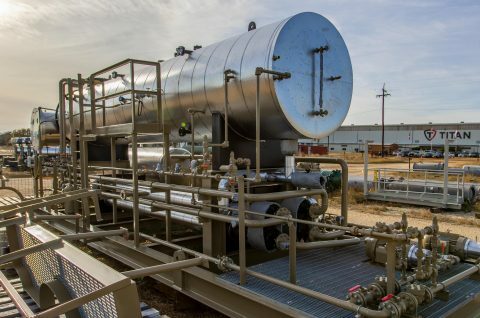 The now independent company is building on an oil field legacy that began in 1927 as Smith Industries before becoming Hanover-Smith and then most recently Exterran. “It takes commitment and drive coupled with strong resources to be a market leader, but that’s exactly what we’re 100 percent focused on,” says Werner. Titan Production Equipment was founded in 2018. As a 100% production equipment-focused company, Titan provides a high level of service, quality and capabilities to fulfill customers’ equipment needs around the separation, processing and treating of oil and gas hydrocarbon streams. Titan offers deep engineering expertise and has capacity to manufacture at high volumes in an ASME-certified facility that produces both pre-designed and custom separators, heater treaters, glycol dehydration units, as well as a wide range of other production equipment products. Additional information about Titan Production Equipment can be found at https://www.titanpeq.com/.